Performers include: Colin Morgan, Bradley James, Anthony Head, John Hurt, Richard Wilson, Katie McGrath, Angel Coulby, Michelle Ryan, Caroline Faber, Michael Cronin, David Durham, Gary Oliver, Rick English, and Ed Coleman. 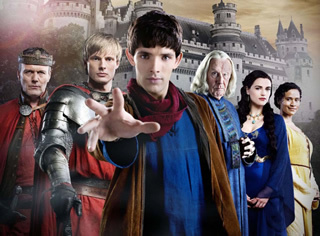 A drama series that brings a new take to the story of Merlin (Colin Morgan), the sorcerer of Arthurian legend. In this version, the mythical kingdom of Camelot is a fantastical realm of legendary beasts and mysterious people, a dangerous world where magic has been banned by the stern and protective king, Uther Pendragon (Anthony Stewart Head). Morgana (Katie McGrath) is the daughter of Uther’s deceased best friend, and now the King’s ward. Despite their class differences, she is best friends with her servant girl, Gwen (Angel Coulby). Though Gwen generally has an open and friendly personality, she occasionally butts heads with Arthur. Meanwhile, Nimueh (Michelle Ryan), a beautiful and powerful sorceress, is bent on destroying Uther, Arthur, and restoring magic to Camelot. Merlin escapes the Crystal Cave after regaining his magic. He travels to Camlann and uses his powers to help defeat Morgana’s troops. During the battle, Mordred gives Arthur a fatal wound but Arthur gives him one of his own. As Arthur lays dying, Merlin confesses to his friend that he is a sorcerer and to save him, they must travel to Avalon. In Camelot, Morgana’s spy is discovered and hanged. Sirs Gwaine and Percival hunt down Morgana. She overpowers them and tortures Gwaine to death, but not before she extracts Arthur’s location from him. Morgana reaches Merlin and Arthur and attacks them. Wielding Excalibur (which was forged in Dragon’s breath), Merlin kills her but, even with the help of The Great Dragon, does not get Arthur to the island in time. Arthur thanks Merlin for his friendship and loyalty — and then dies in his arms. The Great Dragon confirms that Arthur is dead. Merlin realizes his destiny is to protect the King’s resting place. He throws Excalibur into the waters of Avalon and then sends Arthur’s body after it. Guinevere ascends the throne of Camelot and Gaius becomes her mentor. Merlin waits by Avalon for the rise of Arthur. In the present day, we see that an immortal Merlin is still waiting for his friend Arthur to rise again — as the “Once and Future King” is destined to do when Albion’s need is greatest. What do you think? Do you like the Merlin TV series? Do you think it should have ended or continued for a sixth season? Merlin: BBC Orders Season Five; Will Syfy Renew It Too? Merlin: BBC One Renews Supernatural Series for Season Three; Will NBC Air It? Merlin: Premiere Gets Less-Than-Magical Ratings; Keep It or Cancel It? I loved this show. They should have a season six. At the end of season five you saw merlin walking in what looked to be a present world time. They should run with that or have Arthur return to Camelot and Gwen to be with child, Arthur comes back to protect the child from evil magic or something. Just thinking out loud, It was a good good show, I watched all 5 seasons twice and got my friends into it. We want season 6 please! The serie cant end like that. Please bring Merlin back! My favorite of all time!! I’ve watched it twice, and it just cannot end this way! All the actors/ actresses were amazing! Season 6! Chop chop!! I want them to continue this show. I was very disappointed they ended it. One of the last good shows left on TV. I loved this show! The ending was not in keeping with the quality of the rest of the show. It would be wonderful to have another season. I want Merlin back please . I Love this Merlin series,my girls enjoyed it so much. please……we need to see more! !